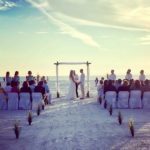 I received a phone call on June 21, 2018, that changed my life. 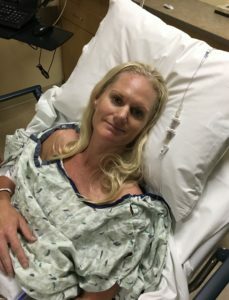 The exact wording is fuzzy but I distinctly remember “the biopsy came back – it is melanoma…advanced stage…likely spread…lymph nodes removal…Kona unlikely.” I hung up the phone and sobbed. Fear like I had never experienced before punched me in the gut. 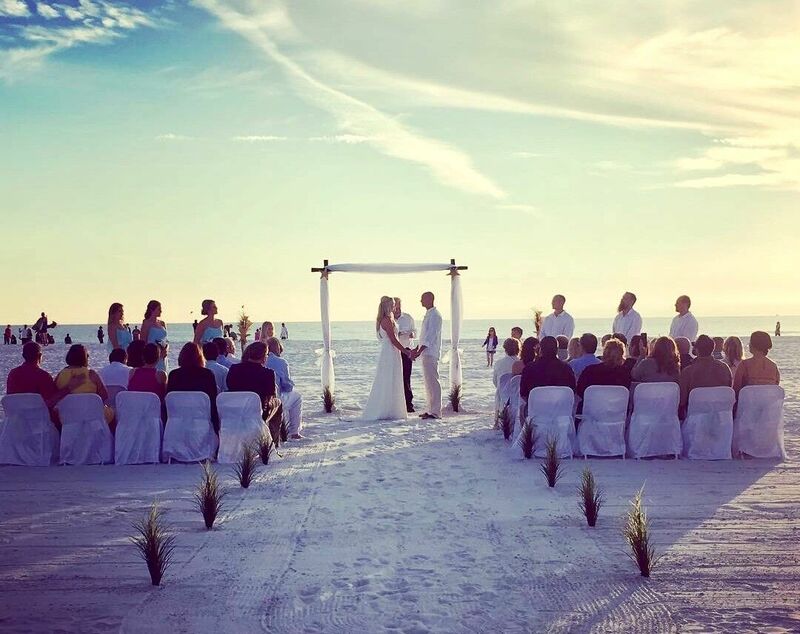 I called my husband, my parents, my brother, and sister, and began working my way down the friend’s list choking my way through sharing the devastating news. Everything I had worked for was slipping through my fingers. Until that call, my life was pretty close to ideal, especially the last 18 months. I was pursuing my dreams and defining my own success. I approach training for races and competing much like I approach most things in life: determined, laser-focused, committed, and give 100% of my heart and soul to it. For racing, I have an incredible coach, he writes my plans, and I execute those plans. Period. 2017 brought many races in which I worked very hard for and I found myself on numerous podiums (placing in the top 3). 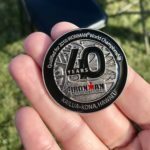 I competed in Ironman 70.3 World Championships and in October of 2017 went on to complete my first full-distance Ironman triathlon, even qualifying for the ever-coveted slot to Ironman World Championships in Kona. 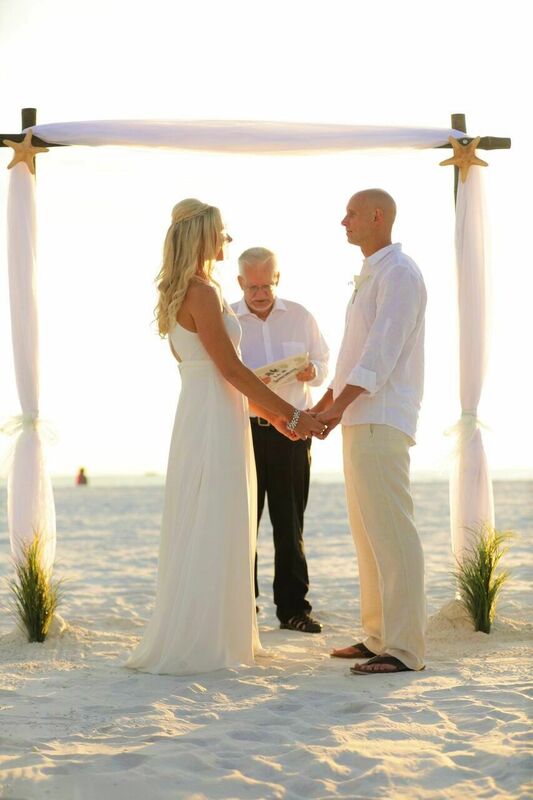 In December I married Jason, a man with a heart of gold, surrounded by friends and family on the white sandy beach of Siesta Key. In January, we celebrated back home with a room full of people who love and support us. 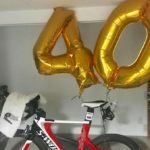 In February I turned 40 and my training for Kona began. 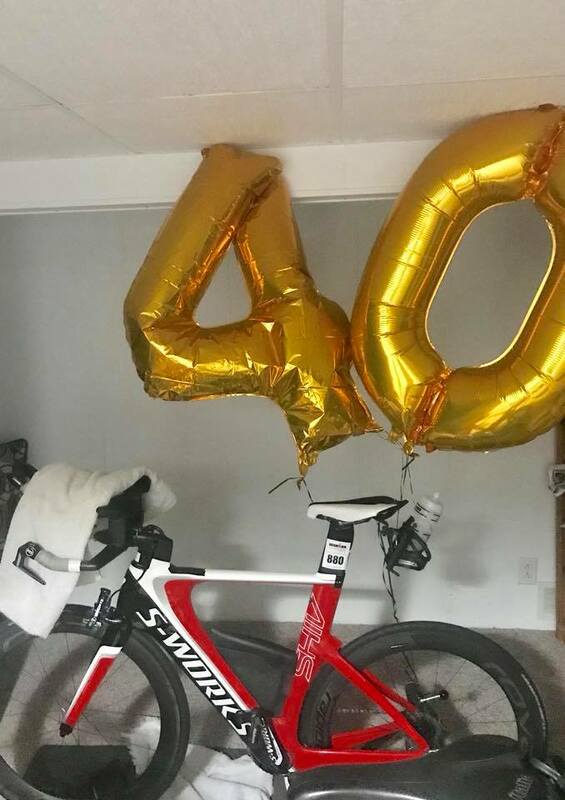 I quickly hit the rhythms that I had known so well – long miles on the indoor bike trainer, pace work on the treadmill, laps in the pool. Rinse and repeat. Each training session was a building block for the several races that were planned and on the calendar. Each race had a new and improved finish time and goal pace. I was confident and excited for what my plan was going to bring. While the phone call regarding melanoma was very devastating, that wasn’t the first sign of trouble for me. Things in my body began to change, and one by one the spring races started coming off the calendar as I found myself battling injury. Discouragement began to creep in but I continued to focus on staying positive. The once nagging pain became debilitating – an MRI and SPECT scan showed numerous discs bulging, a rib stress fracture, Quadrates Lumborum Syndrome (I had to Google it too), hamstring and hip issues — I knew I had to stop. My coach, my physical therapist, doctors, everyone…all told me I had to stop. So I begrudgingly stopped. I approached my recovery as I approached my training – with a plan. I had chiropractic care, ART, physical therapy, a spine specialist, sports med, dry-needling, etc. I had an army of the best medical professionals standing with me and assuring me that we would get through this together. In the midst of all of this came the call which completely uprooted my plans. 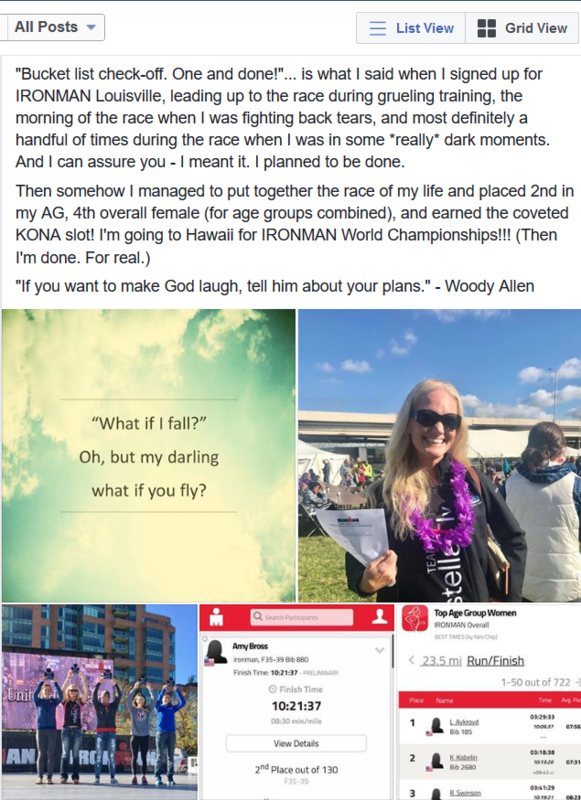 I was okay with taking a few weeks off – all in the name of full recovery for Kona but had never considered I would lose it all. Each week seemed to find Jason and me in a new waiting room. 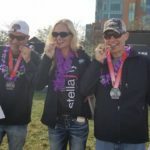 I was passed over to the University of Michigan Skin Cancer Center; we discussed treatment options, and I began to envision the summer plans that would no longer hold training or races. I found it almost impossible to stay positive. I went straight to the internet (never ever do this) to learn everything that I could about the stages of melanoma and the survival rates. I was living my days in a constant state of stress and anxiety like I had never experienced before. I wondered if the injury I was dealing with was connected to cancer. I wondered how many lymph nodes would be removed. Any little ache in my body immediately sent me to the thought that it was cancer. I wondered what my days ahead would look like even though I was encouraged to take one day at a time. Surgery was needed to remove the cancerous tissue. I cried a lot at the thought of how massive the scar would be and what possible chemo treatments would do to my body. I had no idea why this was happening to me. The year began full of promise and it all disappeared with one call. Fast forward to a few days before I was set to go in for the 2.5-hour surgery, another call came from a number that I had come to recognize so well. It was the surgeon. However, this call set us on a different path – the cancer cells were thought to be contained. A team of six from the University of Michigan had reviewed my labs and said that it had not spread. I wasn’t out of the woods yet. I would still need to go in for a fairly invasive surgery in my abdomen, but there would not be any need for further treatment if the margins came back clear. I hung up the phone and sobbed…again. This time out of relief. Ten days after my surgery the tests results came back. The doctor handed me the report and with his hand on my shoulder said: “We got it all – you’re going to be ok.” I have never been a bigger U of M fan than this on this day. My life from this point forward will consist of full body checks every three months. If something is removed, the same fear and anxiety will take hold of me until the biopsy returns. I don’t know that will ever go away after this. As my body began to heal, I was faced with the hard world of training while recovering. I had to face the trauma of these weeks of uncertainty. I was exhausted. The emotional rollercoaster had wrecked me. I quickly came to realize that in triathlon, just like life, the mental and emotional limitations that we place on ourselves, hold us back far more than our physical ones. I had to find the way forward. 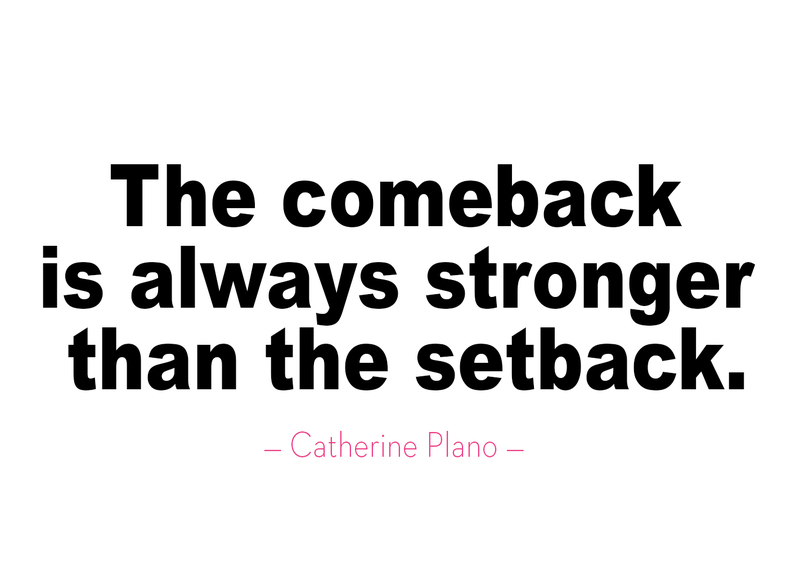 I am learning that a setback is an opportunity to grow. My back/rib injury and melanoma diagnosis allowed me to see what really matters. It’s not that I didn’t know that before, but this time was different. It was a glaring reminder of just how important it is to have a good community surrounding you. I had coworkers step up when I was out for endless doctor appointments. My medical team was working with me during off-hours when their schedules were booked, rushing test results, and leaving no stone left unturned to keep me moving. Our friends provided constant massive hugs, immense amounts of love and support, with no shortage of personal visits, lunches, dinners, bottles and bottles of wine, care packages, flower bouquets, cards, calls, daily texts, etc. My girlfriends were immediately standing strong by my side doing so many thoughtful things to keep me smiling or lending their shoulders if I needed to cry. I found out that there were six different churches that had us on their prayer chains. My parents and extended family showed up (literally and figuratively) in the most tangible of ways to support us. My sisters and adorable niece and nephew flew in from Arizona and Florida to be by my side when the test results came back and my parents were by the bedside when I came out of surgery. My coach guaranteed me that he was walking this journey with me and I dare to say he became just as much my therapist as my coach. And then there is Jason, my husband. 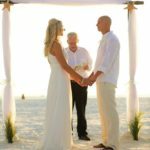 “In sickness and in health” came quite early on for us in our marriage. He held my hand through every single appointment, hugged me tight every single day, and helped me hold my head high. His encouragement, positive attitude, and emotional support gave me strength when I couldn’t seem to find it on my own. I am choosing to define my success by things that truly matter most in life and not by the scars on my body or the paces that I race at. I will be the first to admit how easy it is for me to lose sight of this. I get so locked in on the process and the outcome goals that I tend to lose sight of why I started down this path in the first place – the joy in the journey to the finish line. As I write this, I am nine weeks out from Kona. Not exactly an ideal training timeline for a World Championship Ironman race. I am slowly beginning to move again. I am starting over from the bottom and working my way back up, still dealing with flare-ups from the injury. Each day when I go out to train, I am waging war against the nasty voice that says, “Give up, it’s too late”, or “I can’t do this”, “I hate this ugly scar”, and worst of all “I’m not good enough anymore.” I made a promise to myself (and to my coach) to continue to show up every day and to give myself some grace. I am choosing to talk to myself differently and to provide the same supportive love, encouragement, and empowerment that I give to my other friends and teammates to myself. This is not an easy task. It’s far easier for me to motivate others and celebrate their accomplishments than it is for me to be gentle with myself in the middle of a run or a bike where I’m not hitting my paces that had once come so effortlessly for me. I have to fight hard every day to stay in a positive mindset. I know now that the stories we tell ourselves are the stories we become – and self-pity will derail anyone. I don’t know how this story will end for me there. But I do know a few things that this finish line will include: the reality that the people who help me shine matter more than any pace or podium; that I’ve been given another chance and that each day is a choice to continue to pour positivity into the people in my expanding circle; that my faith has grown and tells me I am not alone and this is not over. I believe in the power of prayer and that miracles do happen.  This experience has also taken me to a level of empathy I did not know I had – I now know what it means for the world to freeze when the phone rings. None of us know the burdens others are facing and this enables me to walk a bit more gently with others. I’m learning that life is about a lot of small choices that we make every day – tomorrow is never promised so we must choose wisely. On October 13, my plan is to choose gratitude. While it’s still difficult for me to accept that I won’t be going into Kona with a season back-filled with training, races, and PR’s (Personal Records), I’ll go into it being the best that I can be on that specific day. 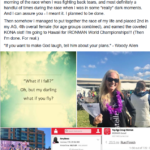 When things get hard out there and I feel like I can’t take another step, I will remind myself to thank God for allowing me the chance to see another day – on the beautiful big island of Hawaii race course (no matter how ridiculously hot and humid it is racing 140.6 miles) – instead of being in a hospital room. 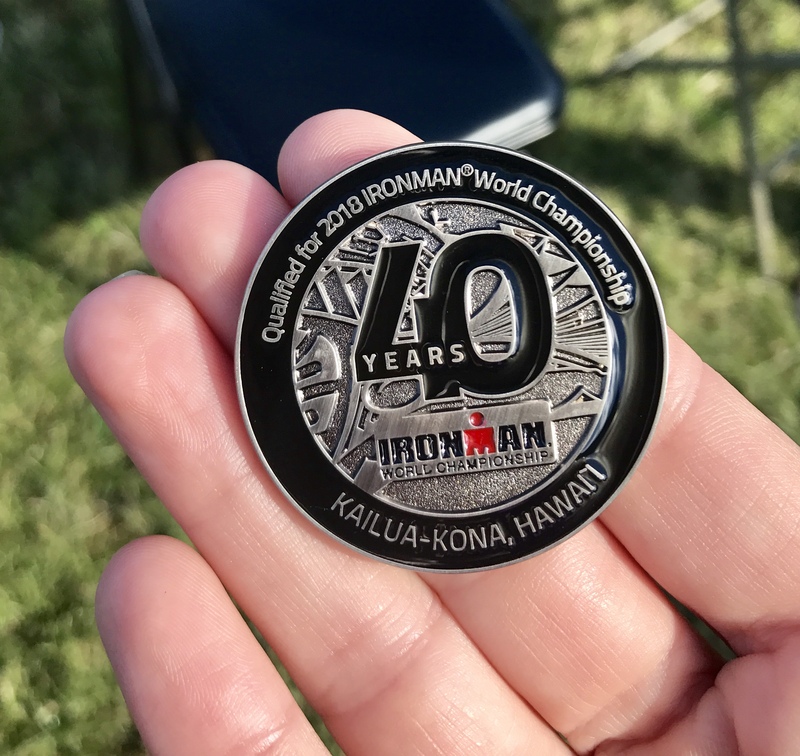 I may have individually qualified for Kona but I am truly blessed to have an enormous support system that has carried me through this season and serve as the source of encouragement to get me through the finish line (with SPF 100!). That is how I’m choosing to define success. This isn’t how we thought our year was going to go. We had a summer full of races and training scheduled out with every weekend accounted for. 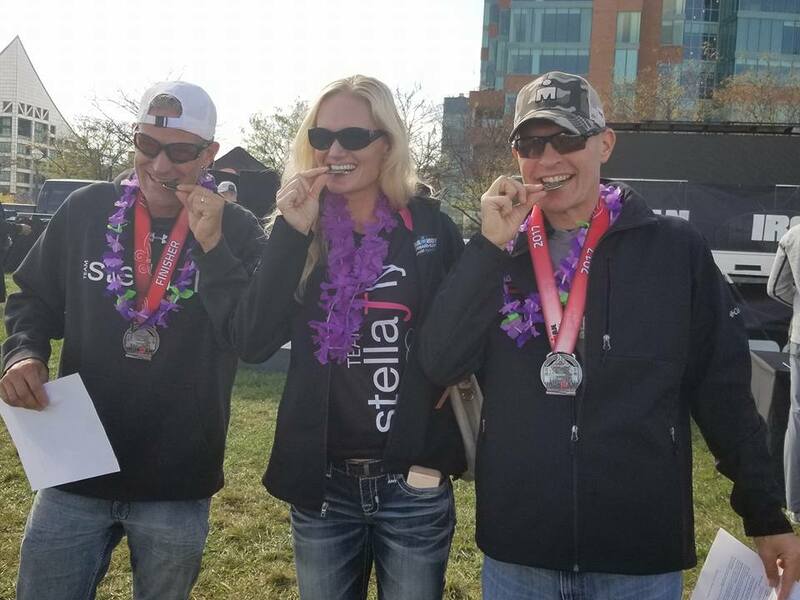 We are competitive triathletes and were excited about coming into this year after podium finishes last year at Ironman 70.3 Austin for me and Ironman Louisville for Amy. 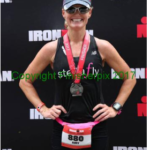 Amy was even heading to Kona with her finish earning her a coveted spot to the Ironman World Championship. Then everything turned upside down. We had dinner together in June and instead of a fun girl’s night out, Amy shared the news that she had skin cancer. At the time things were uncertain for her and the news was shocking. I also knew I had an unusual spot that needed to get checked but kept putting it off. Amy’s news scared me enough to make an appointment the next day. Four weeks later I was getting a biopsy on my birthday. A week after that I got a phone call at work. It was melanoma and needed to be removed immediately. 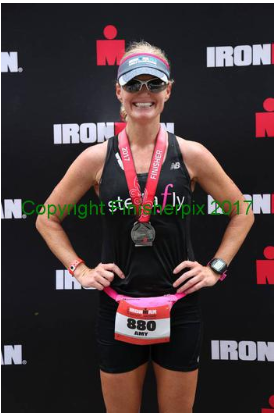 The doctor agreed to wait 2 weeks so I could do the half Ironman race I had been training for since January. I lined up for the swim start with thousands of athletes around me and tears in my eyes. I was racing with cancer and about to head into rough Lake Michigan waters wearing my friend’s speed suit, which was given to me after he passed away from cancer 2 years earlier. I made it through the race, crossed the finish line and then my season was over. All the other races and training sessions came off the calendar. Surgery was scheduled for August 15 and recovery meant no working out for 6 weeks. I was fortunate it was caught early and didn’t need further treatment. Because of Amy. Without her, I would have continued to put it off while unknowingly giving the cancer time to spread and grow. Melanoma accounts for about 1% of all skin cancers diagnosed in the United States, but it causes most of the skin cancer deaths. When I first met Amy, I had no idea she was going to be this important to me. She was dating my friend (her now husband) and we bonded over biking, triathlons and our love of Michigan summers. We became training partners, teammates, and close friends. We look alike, think alike and act alike. We both had melanoma. And we both have matching scars on our stomachs for life. A permanent reminder that struggle gives you stronger wings.